08-21-18, 1-2 PM: Tuesday Forum – Metaphysically Speaking. Palm reader, numerologist and teacher Darlene Denning is the special guest this month on Metaphysically Speaking. Please join Darlene and show host Mike Holloway as they discuss how Darlene got involved with palmistry, the basics of it and how palm reading really can reflect what is going on in your life. Darlene also tells how she employs numerology in her readings as well. It's a fascinating interview that you will not want to miss! That's Metaphysically Speaking for Tuesday August 21st at 1 p.m.
Join host Mark Hall as he’ll be honoring one of our own, Mark Sheeler. Mark was a son, husband, soldier, WHFR DJ, and member of Victory Gym – a non-profit that seeks to help fellow veterans, first responders and the community at large. Mark Hall will be speaking with officers of the gym about their mission and how they can be of service to you. Also, joining IMPACT this week will be Martina Smith, an outreach specialist seeking to help women survive domestic violence. Catch the August edition of WE ARE NOT ALONE hosted by David Twichell this Friday Aug 10 during the New WHFR Journal time slot (1pm-2pm). Twichell interviews an expert in the field of UFOs and other unexplained phenomenon. WE ARE NOT ALONE is part of the Tuesday Forum programming at 1pm on Tuesdays. WE ARE NOT ALONE typically airs the first Tuesday of the Month. Make sure you check out this show and all our WHFR produced Talk Shows on the Tuesday Forum and coming back soon - the New WHFR Journal. 07-03-18: 1 - 2 PM: Tuesday Forum. We Are Not Alone. Dan Wright is a former Michigan MUFON State Director, and was later elevated to the international board of directors in 1986. Dan is in the process of having a non-fiction book published called “CIA CHRONICLE: THE UFO FILES”, in which he highlights many of the governments recently declassified documents concerning the UFO phenomenon. Join us Tue. July 3 at 1PM to hear some of the UFO cases that the US government has kept secret to date. Remember after the broadcast this show is available as a podcast from this website: click on Talk Shows--Tuesday Forum--(select date). 6-26-18, 1-2 PM: Tuesday Forum – IMPACT! 06-19-18, 1-2 PM: Tuesday Forum – Metaphysically Speaking. On the next edition of Metaphysically Speaking, intuitive reader and healer Karen Morgan is the special guest. Although Karen is involved in many modalities, she talked extensively about her ability to use stones in a special bowl in order to clear and activate peoples' chakras while also providing a reading. Karen feels everyone is psychic and her goal is to help her clients tap into their own intuition and guidance for an uplifting experience with every reading. It's a fascinating interview that you will not want to miss! That's Metaphysically Speaking, June 19th at 1 p.m. 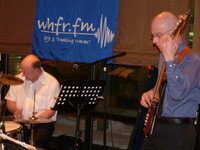 Tune in to WHFR to hear a live recording of Paddlebots! A progressive soul-pop Michigan band. Listen during Noise Pollution today at 1 p.m. and jam out with your new favorites!